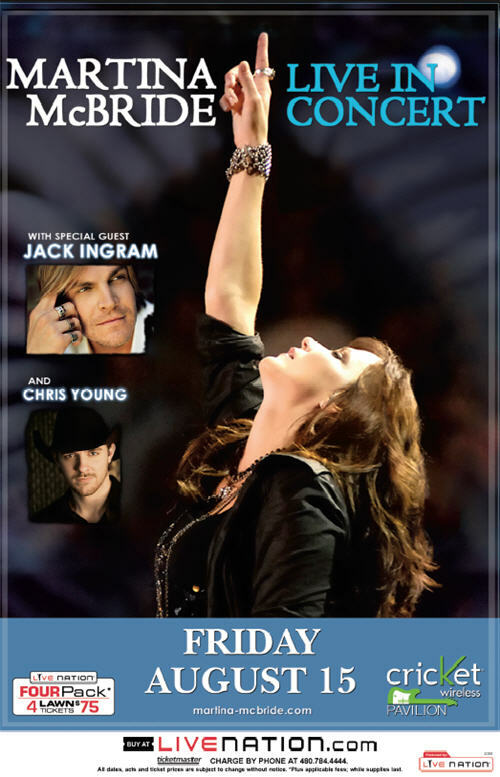 Martina McBride with special guests Jack Ingram and Chris Young will take the “Waking Up Laughing Tour” to Cricket Wireless Pavilion on Friday, August 15, 2008. ACountry presents your chance to win free reserved tickets to see Martina McBride live in Phoenix. With five number one hits, and twenty-two top tens to pull from, Martina McBride’s set at Cricket Wireless Pavilion is sure to give the audience everything they want and more, including “Blessed,” “A Broken Wing,” and “Wild Angels.” In addition, McBride mixes it up with covers of country classics like Loretta Lynn’s “You Aint Woman Enough” and a rendition of “Over the Rainbow” that would make the toughest of men tear up just a little. Her mega-anthems like “Independence Day” and “Anyway” might just blow the roof off the house, if there were one. Tickets are on sale now at Ticketmaster outlets, online at livenation.com, or charge by phone, 480.784.4444.